Speaking in an interview in 2012, Nikolaus Harnoncourt, who died on 5 March 2016, aged 86, said that his closest musical friend was Gustav Leonhardt. Their best-known cooperation is undoubtedly their complete Bach church cantatas, recorded between 1971 and 1989, for which they were jointly awarded the Dutch Erasmus Prize in 1980. Leonhardt gave his share of the prize money to the Oudezijds 100 Society, a centre for prostitutes and drug addicts in the Red Light district of Amsterdam; while Harnoncourt subsidized the Complete Mozart Edition with his share. Harnoncourt and Leonhardt first met in 1950, in a corridor of the Vienna Music Academy, where Harnoncourt was studying cello with Emanuel Brabec. At the time Leonhardt was known simply as a Dutchman who spoke good German; which was not surprising, as his mother was Austrian, had been brought up in Graz and, oddly, knew Harnoncourt’s mother because they had both attended the same school! Their first conversation was less than auspicious: they argued about Die Kunst der Fuge, which Leonhardt insisted could only be properly played on the harpsichord. Harnoncourt obviously didn’t agree, for at that stage he had already spent more than a year learning that piece with his Vienna Gamba Quartet (established in 1949 with Eduard Melkus, Harnoncourt’s future wife Alice Hoffelner, and Alfred Altenburger). This difference of opinion was, however, not an obstacle to their becoming close friends. According to Marie Leonhardt, during those early days Harnoncourt and Leonhardt spent time together almost every day, playing and arguing about music late into the night. Harnoncourt reported that “we played many, many concerts together”, until Leonhardt moved permanently to Amsterdam in 1955. Presumably these concerts were in churches and smaller locations in Vienna, as there’s no record of Harnoncourt and Leonhardt ever having played together at the Musikverein, where Leonhardt made his solo debut (with Die Kunst der Fuge, on the harpsichord) in the Brahms-Saal on 7 April 1951. But why was Leonhardt in Vienna, anyway? Following his graduation from the Schola Cantorum in Basel, Leonhardt had come to Vienna – originally for one year only – to study conducting. This would give him a fallback occupation and placate his businessman father, who thought it unlikely that there was a living to be made by playing the harpsichord. In fact, Leonhardt attended very few conducting classes, and spent his time researching old editions and manuscripts in libraries. The year 1953 was important for both musicians. Harnoncourt was to establish his Concentus Musicus (the first period-instrument orchestra in Europe), with his wife, his brother-in-law, Kurt Theiner, Eduard Melkus, and younger colleagues from the Vienna Symphony Orchestra; Leonhardt was to embark on the first version (see here) of the Leonhardt Consort, with his wife, a cellist, and the recorder player Kees Otten. Both groups rehearsed in the living rooms of their respective founders, and both required a significant gestation period, before they were ready to be exposed to the general public. For the second version of the Consort (see here), this was almost two years; and for Concentus Musicus four years, not counting their anonymous participation in a production of Monteverdi’s L’Orfeo conducted by Paul Hindemith. Their official debut concert was at the reopening of the Schwarzenberg Palace in Vienna in May 1957. Not surprisingly, it was Leonhardt who recommended that Martin Skowroneck make them a lightly-braced Italian harpsichord – his first truly historical instrument – to balance with their authentic strings (see this blog). “For [authentic] musical instruments, we were willing to do almost anything,” Harnoncourt wrote of his life in the 1950s, when money was scarce, and this involved becoming a rank-and-file cellist in Herbert von Karajan’s Vienna Symphony Orchestra in 1952, a job which he endured till 1969.
he reacted strongly against both the military precision of conductors such as George Szell and the undifferentiated approach to early music then prevalent. Handel was played much like Brahms, he later said, and the result was “an unsorted blend of geniality, 19th-century tradition and ignorance”. Harnoncourt and Leonhardt played, with members of the Vienna Chamber Orchestra, in the 1950 Supraphon 78 rpm recording of Bach’s Brandenburg Concertos 3, 4 and 6, conducted by the unsung early music pioneer and teacher, Josef Mertin (1904 – 1998), whose interpretation classes they had both attended. Leonhardt was involved here only as a gamba player, in No. 6, with someone else playing the harpsichord. They also played together in the Leonhardt-Barockensemble (with other family members), in three recordings made for the American label Vanguard in May 1954, with Alfred Deller (see this blog). In the early 1960s, the two men were brought together again by Telefunken’s Wolf Erichson, who was to produce countless recordings in which they took part, including the feted Bach cantata series. Here’s Alice Harnoncourt speaking about her Stainer violin, playing gambas and the early days of Concentus Musicus in a 2001 radio interview (in German). 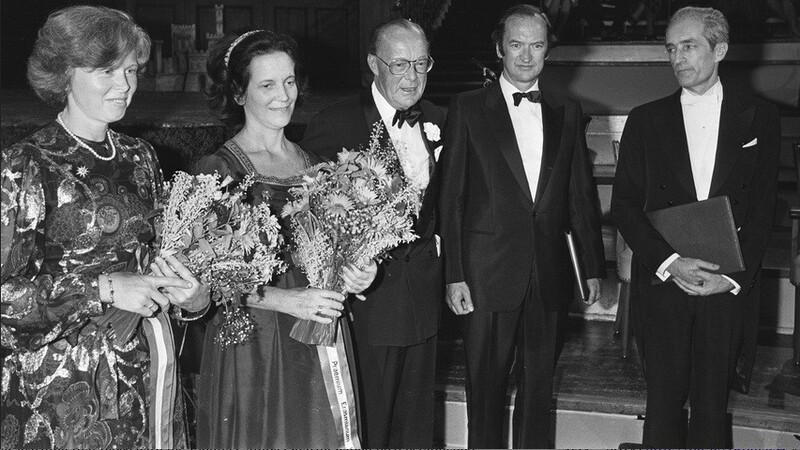 A major difference between their early careers is that Harnoncourt remained a full-time orchestral cellist, while continuing to develop Concentus Musicus, and Leonhardt’s took off very quickly, primarily as an early music “expert”, harpsichordist and organist; for him the Consort was only ever a sideline. An indication of his success is that by 1960, he had bought a genuine unaltered Ruckers harpsichord (a very expensive rarity, even then) and was already doing his eighth annual solo tour of the USA! Leonhardt was fascinated by Harnoncourt’s extensive collection of authentic instruments (more than enough to equip a small orchestra), which he’d found in antique shops, monasteries, attics and auction houses, and bought at low prices because no one else wanted them. In Holland, Leonhardt had only seen his cello teacher’s newly-made gamba and violoncello piccolo, which were really just modern cellos with different stringing. Strangely, although Harnoncourt started the gamba before 1949, it was not until his involvement, with Leonhardt, in Straube’s Chronicle of Anna Magdalena Bach, in 1967, that Harnoncourt started to play it with under-handed bowing (see below). Everything in the film was authentic, down to the last detail; so he could hardly play the gamba, in the role of the Prince von Anhalt-Cöthen, commissioner and dedicatee of Bach’s gamba sonatas, looking like a 20th-century cellist. Leonhardt repeatedly said that there was enough early music to fill several lifetimes, let alone one; he never played music from later than the end of the 18th century, and only once made a recording on the fortepiano. He conducted comparatively rarely, and in 1998 said, “Why wave your arms around when your fingers still work?” He gave around 100 concerts each year, mostly solo harpsichord recitals, right up until the end of his life. For Harnoncourt, in contrast, from 1972, when he made his debut on the conductor’s rostrum with Monteverdi’s Il ritorno d’Ulisse in patria at the Piccola Scala in Milan, his focus was on leading from the front rather than from the cellist’s desk. His work with Concentus Musicus continued, though, and apart from their many recordings they gave some 250 concerts between 1968 and 2015 in the Musikverein in Vienna alone. As his repertoire broadened to include Bruckner, Schumann, Beethoven, Brahms, Alban Berg, Offenbach and Dvořák, among others, he was invited to conduct “modern” orchestras, such as the Chamber Orchestra of Europe, the Concertgebouw Orchestra and, later, the Berlin and Vienna Philharmonics, even making two appearances at their New Year’s Day concerts, in 2001 and 2003. Aged 80, he continued to surprise and delight by recording Gershwin’s Porgy and Bess, typically making his own “authentic” version, based on original sources. according to The Times, “Nikolaus Harnoncourt was unquestionably the foremost authority on historically informed performance”; the Telegraph led with “Brilliant conductor who relentlessly pursued authenticity in both early and modern music”; in Scotland the Herald said, “A rival and, some would say, the obverse of the ostentatious, autocratic Herbert von Karajan, to whose conducting style he was in every way opposed”; he’s described in the Guardian and elsewhere as “one of the most influential conductors of the 20th century”. Leonhardt didn’t like talking about himself: he often said, “I’m just a performer”, and was averse to having live performances recorded or filmed. Most of what we have of him consists of around 200 studio recordings, plus a film of him conducting a Bach cantata and, somewhere in the archives, a few clips and an interview from the 1970s filmed at his house on Amsterdam’s Herengracht, for Dutch TV. There’s also an hour-long TV programme, online, with Han Reiziger, in Dutch, with subtitles. Leonhardt wrote only one book on music (in 1952, about Die Kunst der Fuge), but did contribute some articles and a preface to a few works; here’s a comprehensive list of his publications. There’s also a biography in French, Jacques Drillon’s Sur Leonhardt, based mostly on previous interviews. A short amateur film of him improvising – in 17th- and 18-century styles – on an old organ in St. Petersburg has recently surfaced on Facebook. In contrast to Leonhardt, Harnoncourt wrote several books about his approach to music (some of which have been translated), and there are also a number written about him. The following are available only in German: a 50th anniversary volume about Concentus Musicus (Die seltsamsten Wiener der Welt); a 1999 biography by Monika Mertl, and Being Nikolaus Harnoncourt, published to celebrate his 80th birthday. As he didn’t object to being recorded or filmed, there are many commercial DVDs and YouTube videos of him conducting, giving master classes, taking part in documentaries, being interviewed (a particularly nice one, on his 85th birthday, is here). in which gives as good as he gets from the two rather irreverent hosts. Another particularly charming short film is with Cecilia Bartoli, in which they talk about and perform excerpts from Haydn’s Armida. Harnoncourt made more than 500 recordings. There’s also a fascinating and comprehensive website, with family photos and a timeline, which charts his life and career from the very beginning. Although Harnoncourt’s full name was Johann Nikolaus Graf [Count] de la Fontaine und d’Harnoncourt-Unverzagt, and he was related to Hapsburg emperors and half the royalty of Europe, it was Leonhardt who had the aristocratic bearing. According to a former Harnoncourt student, the only indication of his noble roots was that he had very good manners.